Let me state that this article is a work in progress. My intent is to keep updating this article, but as of today, its far from done. So why let it be public. Because I am hoping you will give me feedback on what it is you would like to see — and even where it is you think I have it wrong. This is a blog post and not a substitute for product instructions or common sense. I’ve had people imply that I was an expert in this area or that area, but I’m just a guy who has been in the home improvement industry since I was old enough to work. I grew up working in my Grandfather’s lumberyard and from there I went to distribution, to manufacturing to my own company. The one thing that has remained constant is liquid applied products, in all of those industries are shrouded in mystique as if you need to be a rocket scientist to figure them out. They scare the daylights out of our customers, and to be frank even some of our staff from time to time. There are just so many variables. There is also a lot of crap, bad advice, good product and good advice. There are customers who take the time to learn and there are customers who don’t. Where do we start? The Concrete! Lets state the most common things right off the bat. YES YOU NEED TO PREP, EVEN IF THE CONCRETE IS NEW. Your concrete needs to be 28 days old or older. It needs to be free of moisture and it should be tested for hydro static pressure. Personally I like this moisture test kit but there are a lot of others. In most cases a result under 3 is good. Take it in multiple spots and take it during a period of time you would expect there to be problem. If your concrete is really soft, chalky or dusting excessively, coatings may not adhere. Often grinding will get this layer off. If it does not, do not proceed! Your concrete probably has saw cuts or expansion joints. You absolutely don’t have to fill them, but you also absolutely can. They were put there for a reason, so unless you have a compelling reason to fill them. They were put there to control the cracking in the concrete. I wouldn’t. For many people, the compelling reason is all the crud the accumulates in the cracks. If that is going to drive you nuts, by all means. But How? NOT with crack filler please. You need to use a product specifically designed for joints. I like the gel based products that you can shave off when they tack over. But there is no shortage of options. You can also use a product like Sikaflex when you are done and simply ‘caulk’ the joint. Cracks get filled with crack filler. Some joint filler can be used in cracks. Again never use crack filler in a joint. If you can fit anything in the crack, it needs to be repaired. If the crack is growing, it needs to be repaired. If you need to ask, the crack needs to be repaired. If your concrete cracks under your garage floor coating, your coating will crack. Best practice is to grind it out twice the size of where you started and fill it in. Again I like the gel based stuff. Your concrete needs to be prepared. If you have had a sealer, a cure and seal or an unknown curing agent used on your floor we would very highly recommend grinding. If you have not, you have options. Grinding is almost always best. At the end of the day it comes down to concrete surface profile. I live in a house that is well over 100 years old. The original wood floor was warped, failing and not very attractive. The previous homeowner decided to take brand new solid oak flooring and run it directly over the old floor. I’m sure it looked great the day he did it. But, if you look at it today, its warped, uneven and has lots of flaws. In short, it was only as good as what it went over. 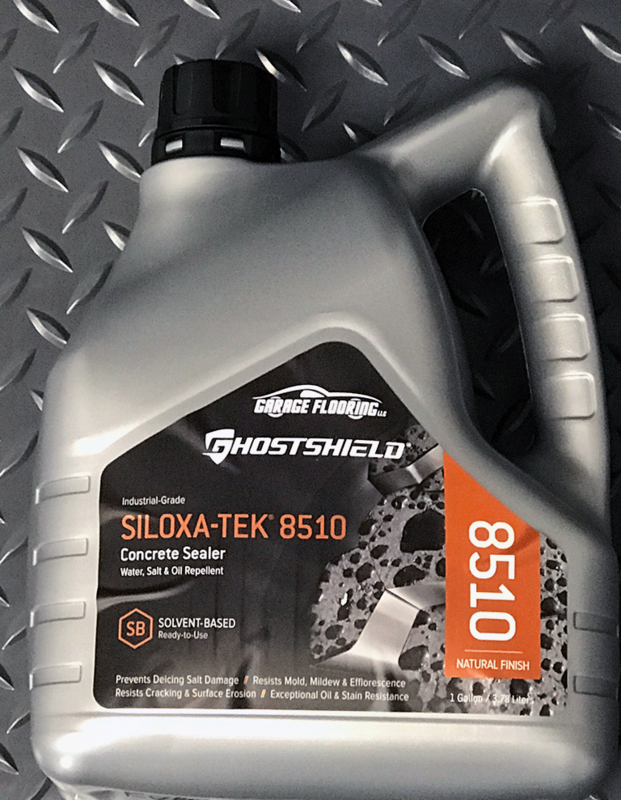 So you are going to spend $1,000 on a brand new coating, but you don’t want to take the time, energy and money to remove the old failing coating? What do you do? We’ll, I would grind off the old coating. If you are not up for that, this is what you do — but you do it at your own risk. Pick a small, inconspicuous portion of your floor. Abrade the surface with a sandpaper. Wipe it down with denatured alcohol. Test the new coating. Assuming everything turns out well, apply this procedure to your whole floor. Just understand, if and when the old coating under it fails, the new one will go with it. There is an exception: If you have installed a high end coating system and want to freshen it up, you can follow the same procedure to add a new coat of clear. Always check with the manufacturer or distributor for details. Is thicker and heavier better? Lets start with a comparison, expand on it about and talk about how thickness is measured. Lets assume for a second you were going off to battle. Would you prefer a thick heavy vest or a thinner, lighter one based on new technology. I supposed the answer would be that it depends on what I am up against, how I am going to be moving around (walking versus driving) and what is better suited for my needs. For years in the industry we have talked about 100% solids epoxy and thicker is better. There is a lot of truth to that, but it has to be relevant to how you are using the floor. When we talk about the thickness about your garage floor coating, we will almost always refer to in in Mils. Typically the system thickness excludes flake and other broadcast media. So what is a Mil. A Mil is 1/1000th of an inch. Now stop and let that soak in. As you are considering this, keep in mind the average sheet of copy paper is 2-3 Mils thick. Then consider the what some of the big box stores are offering. Company A offers a 100% solids kit that covers 400 Sq. Ft. for $400.00 Company B offers a chemically identical kit for $300.00. How can that be? Well company A could be overpriced, but the answer likely is in coverage. Epoxy coverage is in a range. Unlike paint, its not a question of how far it will go. It’s a question of how thick the system will be. In most cases, company B can sell a less expensive system to cover the same area because they are spreading it thinner. Chances are company A could do the same thing, but they understand the value of a higher build epoxy system. That’s just one way to impact the price. Another way to impact it percentage of solids. You go to the grocery store and there are two bags of chips. They are both the same size. One is 99 cents and is 3/4 air. The other is $1.99 but is filled all the way to the top with chips? What is the better value? Many of the inexpensive epoxy products on the market are 50-80% solvent or water. That means you are only getting 20-50 percent of what you paid for. Where that shows up is in Dry Film Thickness or DFT. You might put it on real thick (Wet film thickness WFT) but as it dries, the solvent or water evaporates and you are left with a thin coating. In summary, the percentage of solids and the spread rate (coverage) are all ways to manipulate coatings pricing. They are also valid ways to save money and spec out a system. You need to look at the dry film system thickness as it relates to similar systems (epoxy to epoxy, polyurea to polyurea.) Thin mil products do have benefits. We use them as primers because they penetrate and stick better! BUT what does it mean? First and foremost, even in the best technology we have seen a 1-1.6 mil system thickness is not going to protect your floor. But is thicker always better? Going back to my example above. What if the new technology came in lightweight, a regular and a heavy weight. The correct comparison would be new technology to old technology. You really would not care how it compared to the old, heavyweight protection. What you want to know is which one is most likely to stop whatever might be coming your way in the new technology. The same is true of coatings. 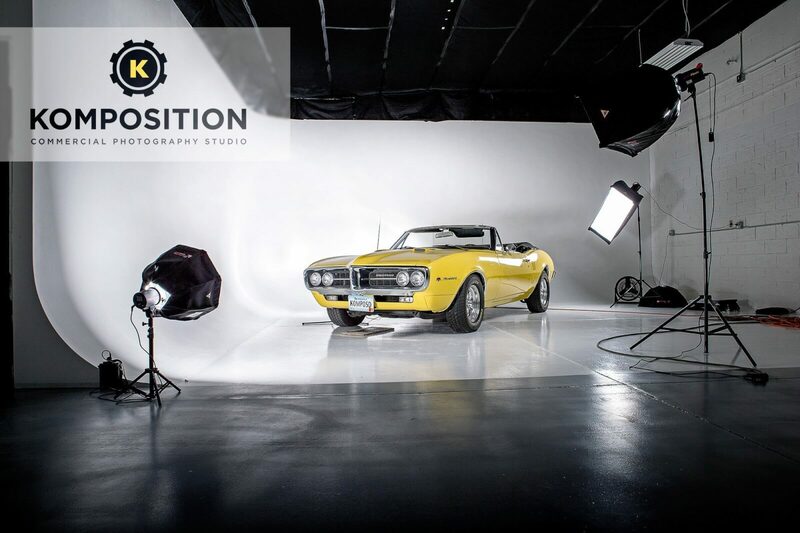 There is the original garage floor epoxy technology. Typically here we want a medium to high build system. There is also newer technology mostly in ‘Thin build’ systems. There are a lot of different products out there. For our purposes we are going to look at three products. Epoxy systems, polyurea systems and the Rust Bullet product. Epoxy systems need to be a medium to high build in order to perform. That is not a flaw, it is simply the technology. 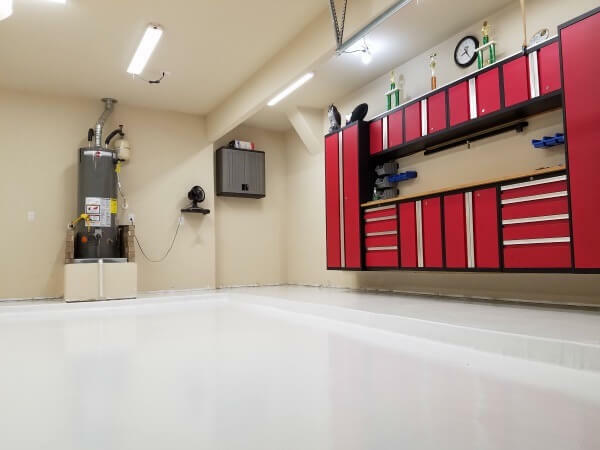 If you look at epoxy systems offered by industrial professionals, you are looking at a primer coat that is thicker than big box store’s main product. Then you have a high solids to 100% solids base coat of epoxy. A broadcast media and a urethane top coat to protect the epoxy. So lets put this in real world numbers. 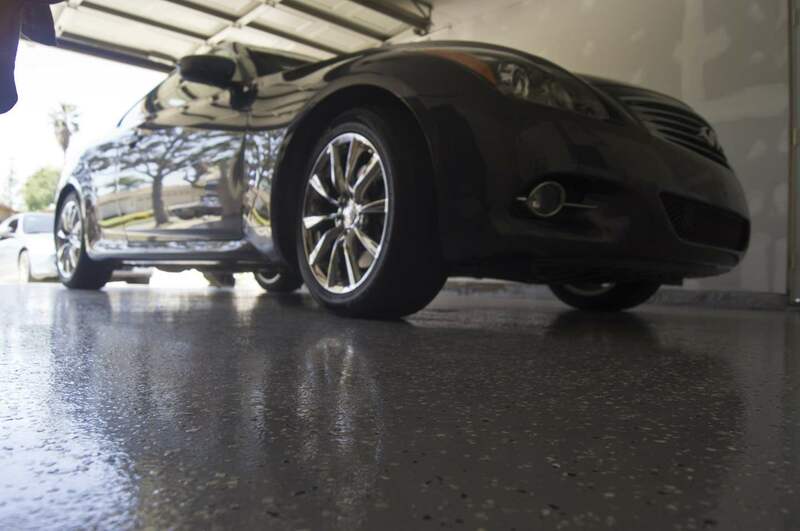 Our DIY garage floor coating is a high solid epoxy — about 90%. It uses the same resin as our 100% solids but has a little solvent added to the hardener. This system uses a primer that will go on at about 5-6 Mils and dry at 2-3 Mils. More on that in a minute. The epoxy itself will dry at 8-10 Mils and the top coat will dry over 2 Mils. This means you end up with a 12- 14 Mil system — compared to a 1-3 Mil system. In this instance thicker is better. Now our 100% solids system is thicker yet. In theory, the 100% solids system is ‘stronger’ but not in ways that are going to be noticed in most residential applications. Where it does get noticed is on heavily repaired floors or incredibly high impact floors. 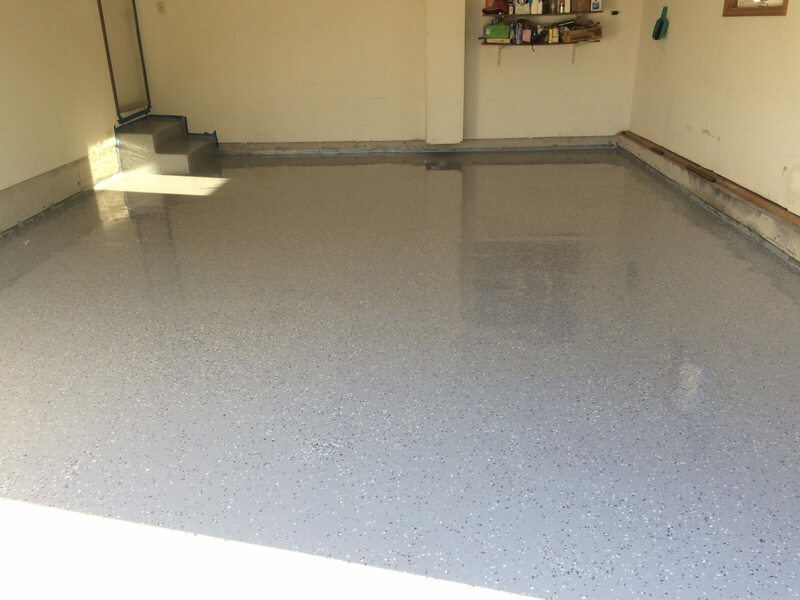 Because epoxy systems are higher solids than urethane systems, floor preparation is absolutely key! Polyurea is by definition a urethane. Urethane is thinner mil than a good epoxy and also has a lower percentage of solids than a good epoxy. In many cases, a thinner Polyurea system can outperform a thicker epoxy system. There are cases when epoxy will make more sense. Typically this is a heavily repairs surface or a ultra high impact surface — like forklift traffic. Dollar for dollar, for my garage, I would likely use a polyurea system in most cases. Why? When you look at urethanes there are a lot of different types. You have try polyurea systems, true polyaspartic systems, moisture cured urethanes such as Rust Bullet, aliphatic urethanes and more. 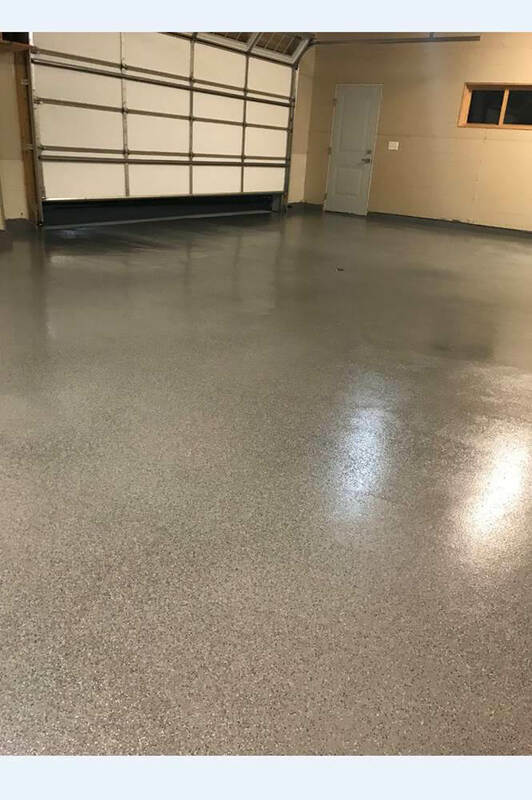 Our polyurea garage floor coating system, from a scientific standpoint is a hybrid polyurea and polyaspartic combined with some necessary properties from a moisture cured urethane. A complete system is going to start at only 10 mils thick. But it is built to perform at that thickness. Now, go back to something I said earlier. What do you do with an epoxy system after you finish the epoxy? You protect it with a urethane. Advanced systems like our polyurea allow you to have the benefits of a urethane throughout the entire system. The pot life is unlimited so you do not have to rush, it is highly chemical and UV resistant so you do not have to worry about ruining your new floor. Most of our DIY customers get a much better finished product using polyurea than they will get with epoxy. We got a little off track here. The key is Polyurea systems can perform very well at a lower DFT. That said another important fact is that there are situations where building up the thickness of a polyurea floor makes sense. That is why we offer different systems. 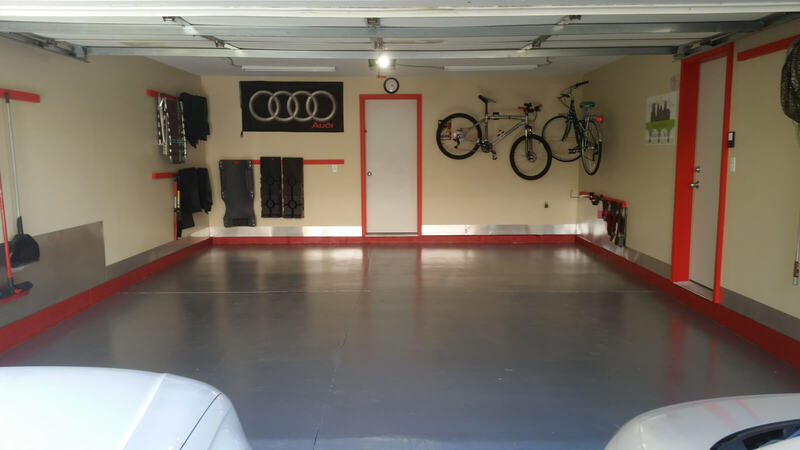 The average residential garage is just fine with a two coat system. The shop or commercial use will me better off with three. In general, urethanes have more solvent and more odor. A good urethane is going to run 60-70% solids. Just like an epoxy system, the way to make it less expensive is to add more solvent or take the same coating and spread it further. We have optimized our coverage rates for performance. Not for price. Because urethanes are higher in solvents and lower in solids, you can often get away with less prep. Acid etching instead of grinding is common. Some urethane products like Rust Bullet offer a no prep system. This system comes with caveats that are very important to understand. You need to make sure your floor will absorb 1/4 cup of water quickly or you still need to prep. If you are going to prep anyway, polyurea is a better choice in many cases. You prepped your concrete and picked a coating, but don’t let this important product slip through. 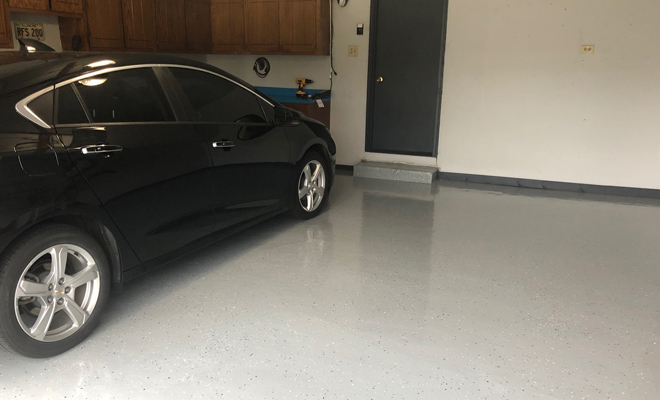 Anti Skid is one of the least thought about parts of a garage flooring system and likely the one that you will notice the most. 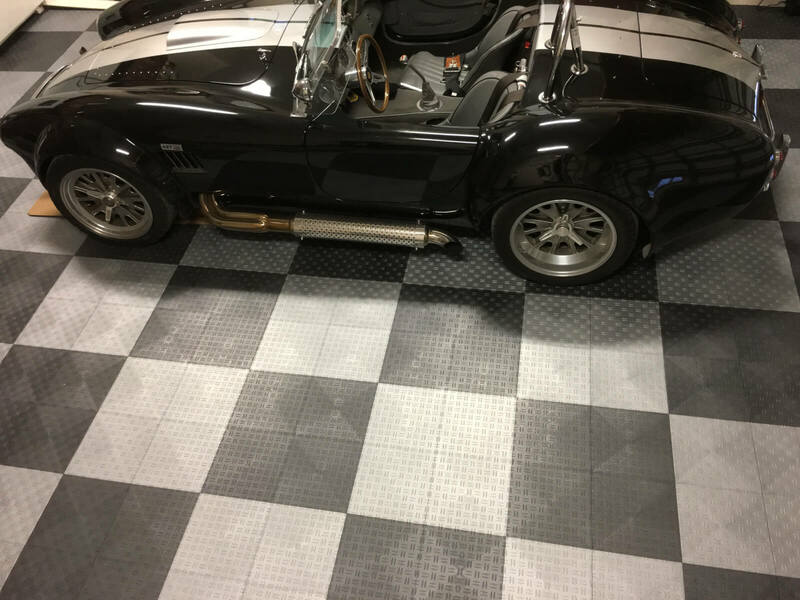 Assuming you did everything else right, the anti-skid product you decide on will often be the difference between loving and hating your garage floor. What is your priority? Is your main concern making sure your wife does not slip when she gets out of the car on a rainy day or is it making sure the floor is easy to clean — hey, no judgement here. Tabular Alumina — This is my favorite. It is a very fine, powder like substance added to the final coat. It adds a little texture to the surface based on the low end of the recommended amount. A little more texture at the higher end of the suggested amount. Under a microscope it is rounded, so it is still very easy to clean your floor. It is also extremely hard and was originally developed as an anti wear additive. So used appropriately, it helps keep you from slipping while making your floor coating stronger — but its still easy to clean. That said, I would still not suggest dancing in the rain, or doing laps while the snow is melting off your car. This type of anti-skid is heavier than the coating so it tends to sink to the bottom. Add it like flour to a cake mix and stir a couple times before you add more coating to the tray. Polypropylene balls — There are several brand names of this type of anti-skid on the market. It can be fairly aggressive and give you more of the course sandpaper feel. It is harder to clean but it can provide a higher degree of traction in wet environments. It tends to be lighter and float in the coating. The same suggestion holds, mix in slowly, mix it well and keep mixing. Silica — This stuff drives me nuts. It is by far the hardest to clean. At least one of our manufacturers includes it and I would almost never use it on my floor. If I was going to use it, I would use it in my primary color layer so the clear softens it up a little. 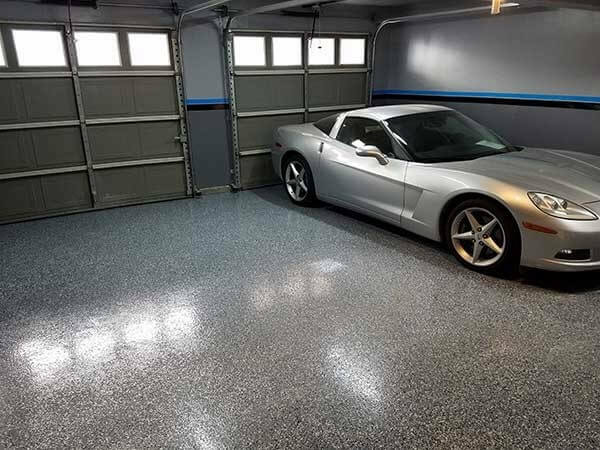 To me the only real place for this would be a commercial environment where liability was a primary concern or a really wet garage floor — in which case I would not be using a coating to begin with! A little Flaky — Or maybe a lot. 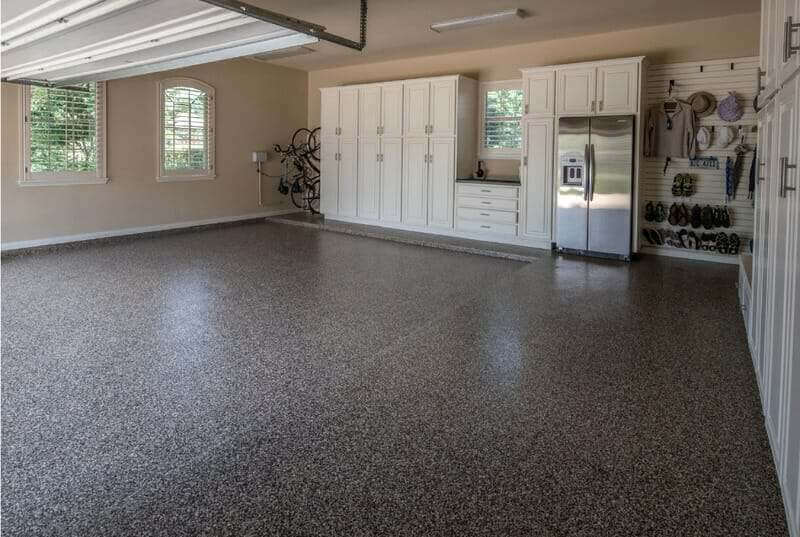 How much flake to put on your garage floor coating is relative. Flake sizes are all a matter of preference. There are two basic systems that we talk about. 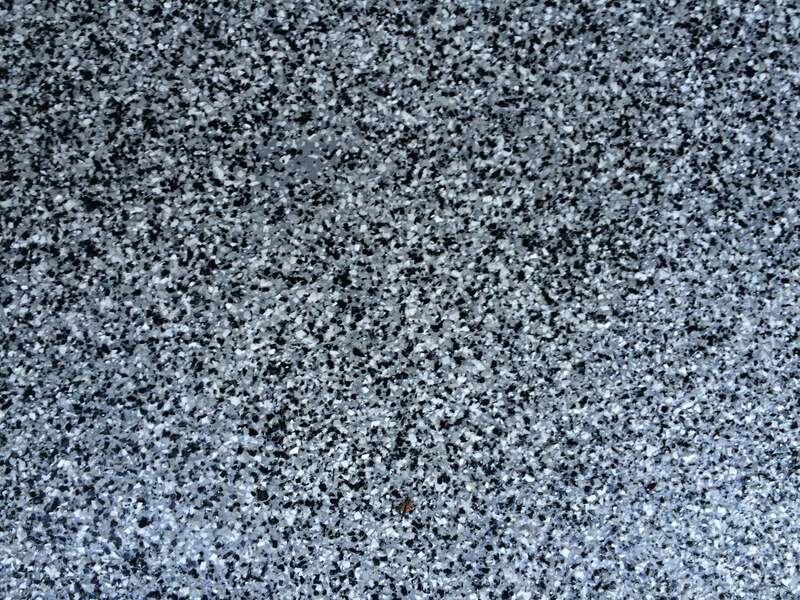 Random Broadcast — the coating color is apparent and additional color comes from flake. Then there is full broadcast — If done perfectly, you would never know the color of the coating below. Most of our kits are random broadcast. How heavy or light a broadcast is a matter of perception. Home center kits include a small amount of flake. Perhaps 16oz for the whole floor. We tend to include 1# per 100 Sq. Ft. for a random broadcast floor. The picture shown here is about 1# per 100 Sq. Ft. We like 1/4″ flake for random broadcast. Full broadcast floors require a lot more flake. If you are estimating your needs, and you are relatively sure of yourself, I would take your square footage and divide by 6. If you are not sure of yourself, divide by 5. You are going to have some left. That’s the idea — and no in most cases its not worth returning. We are moving towards 1/16″ flake for full broadcast but some systems still include other sizes. Our installation instructions have more details, but in general you want to throw flakes slightly up as opposed to down when doing a random broadcast floor. You get a more even distribution. My personal preference is to have someone walking on dry concrete in regular shoes throwing the flake over the area I just coated. If you are working alone, you may need spiked shoes. After your base coat dries and before you use the clear, there is another step. YES YOU NEED TO USE CLEAR. Use a shop vac or a scraper to remove any flake that are not stuck to the floor. I would use a shop vac with some duct tape over the edges so the color of the vac does not come off onto the floor. You can also use a scraper. Remember, be nice. You want to get the stuff off that did not stick, but you do not want to try and tear the good stuff off. If you are doing a full broadcast floor, there is an option. Most people do not do it but it yields an amazing result. Rent a buffer and run fine sandpaper (NOT SCREEN) over the flake. When properly done with a product like our Polyurea even your first coat of clear can turn out very smooth. We still suggest two coats. Please turn off any ignition sources while working with solvent based coatings or any flammable product. While unlikely, it is possible that while flashing off there could be enough solvent in the air to ignite. Generally speaking, running gas based heat or forced air type heat in the garage during the install is a bad idea. Propane heat is an especially bad idea. Gas heat pumps moisture into the air. This is not good. Forced air can create all sorts of problems. If you need to heat the area, heat it before the installation. Make sure to heat it enough that you can allow for adequate ventilation. You MUST have good ventilation during the coating process and at least the first 24 hours of cure. Check with specific products for details. If you get these products on you (or someplace you did not intend), they are not coming off. I really thought this was common sense. You are installing a high end coating. If you get it on you or someplace you did not want it, chances are you are just going to have to wait for it to wear off. No, we don’t suggest washing your hands in solvent. In some cases you can get it off non-living items with solvent if you act quick… But probably not. Wear long pants, a long shirt, a hat, a respirator if suggested and two pairs of gloves. Always check the SDS or MSDS for safety specifics. We mentioned this before but just to be clear. If it has a solvent, wear a paint respirator. Make sure you allow for adequate ventilation! Epoxy hardens fast. Especially in the bucket. DO NOT LEAVE IT THERE. We actually had one customer mix it in a bucket and put a lid on it. REALLY bad idea. Long story short, epoxy hardens from a chemical reaction. That chemical reaction causes heat. Left in a container the heat from the reaction builds and causes the reaction to speed up. You end up with a $500 brick. Mix each individual part. Then mix the two parts together. Then dump it on the floor in ribbons. Depending on the product you will then either use a roller or a squeegee (followed by a roller) to spread the product. Always print the SDS sheet and the technical data sheet. If you are going to split two part products you must split exactly right and using the measurements provided. For example, if it says Mix 2:1 by weight, don’t use two cups of part A and one cup of Part B. Some products like Polyurea need to be tinted on site. If you are tinting on site, remember the tint quart included is enough for a gallon. Don’t dump it all in a quart or use just 1 in a five gallon. Mix all tinted material for a coat together. This way if you have more tint in one gallon that you do another, the color will match throughout. Always maintain a wet edge. If you can’t maintain a wet edge stop at an expansion joint or saw cut but understand if you overlap you will see a line. Use the right rollers and tools! Read all instructions first. Then read them again. WAIT. Coatings need to cure. Our Polyurea system, for example needs at least 72 hours. Do not count the overnight hours if its cold out and your garage is not heated. Epoxy systems should really be left alone for a week or so. Open all your boxes and inspect everything. It would be awful to find out that UPS lost your top coat after the you installed the epoxy. It would mean you would have to sand down the entire floor and solvent wipe before installing the top coat. Recoat times matter! No you can’t come back in a week and finish your floor. You will not have full adhesion. You will need to do additional prep. We have tip sheets and instructions for epoxy and polyurea systems. Read them. 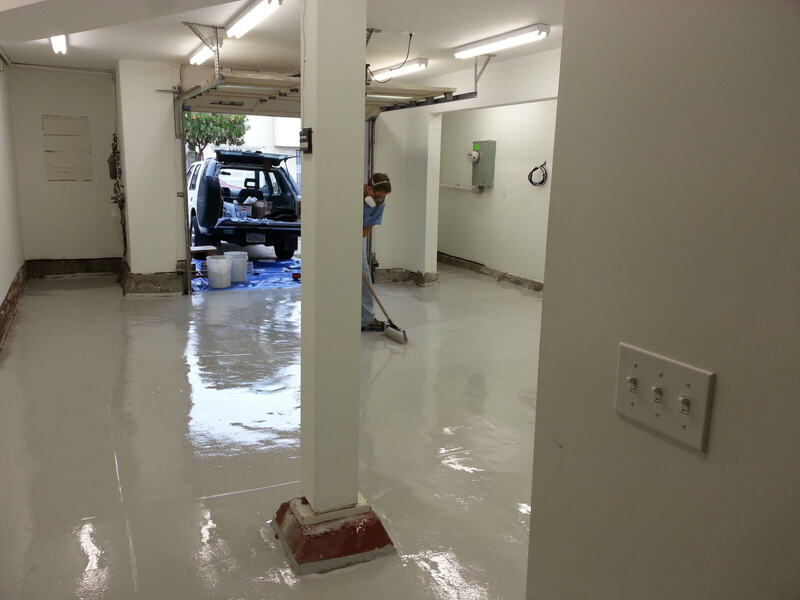 The first rule of an epoxy coating is that you should prime the floor. The higher the solids the more important this becomes. If someone is selling you a 100% solids product and telling you that you do not need a primer RUN. If they tell you that a high solids or 100% solids product is self priming RUN. The vast majority of epoxy issues could have been avoided with a primer. Urethane based systems have more solvents in them. Depending on floor condition a primer is not usually required. If you feel a primer is a good idea, simply use the same product in the same color and apply a thin coat. There are also some multi coat systems in both urethane and epoxy that are lower solids. In these systems, your first coat acts as your primer. Fix it or expect it to show through. It might show the same day, it might show in a month or year but it will show. Please look at the chemical resistance of your top coat and match it to how you use your floor. Top coats are essential. With epoxy, in most cases, we use an aliphatic urethane top coat. With Polyurea we just use the Polyurea –no tint. The top coat is the first layer of defense. You need to make sure it is compatible with what you do in your garage. 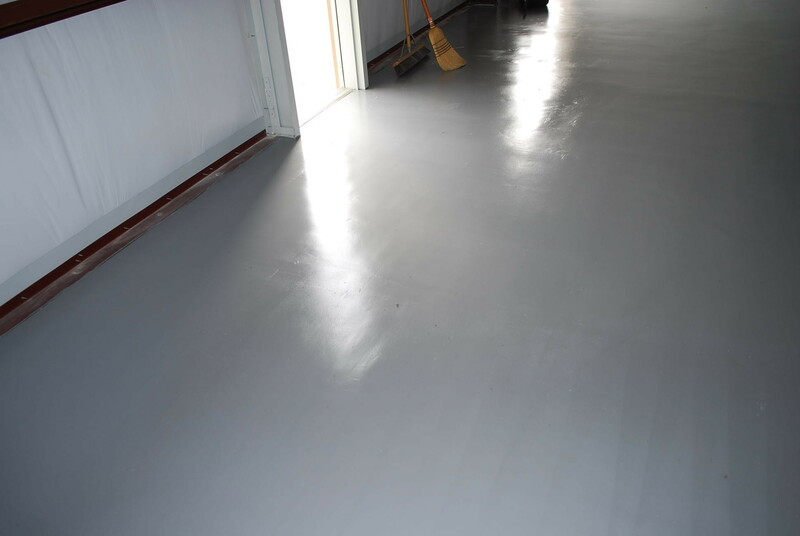 Generally clear epoxy top coats are not preferable, except as an intermediary coat. The exception will be if you live in an area where the VOC laws make it impossible to do a good urethane. 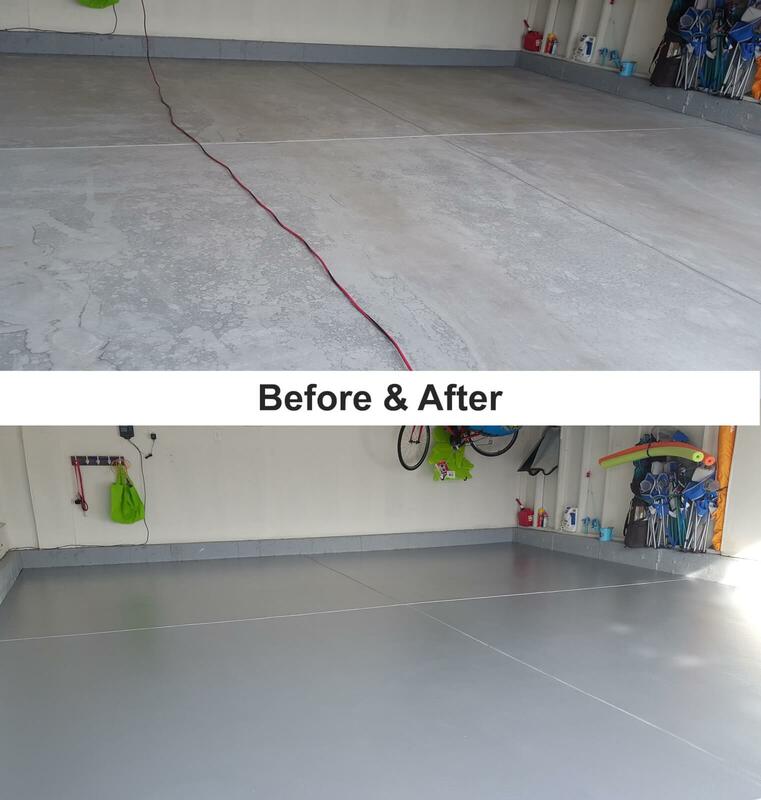 We've found that polyurea was a great solution for those that had planned for a garage floor coating project during the summer, but just couldn't get it done for a variety of reasons until the Fall. The day time temperatures were still close to 60 degrees or so, but the night time was in the low 40's. The coatings cured very nicely with none of the ill affects when epoxy is applied in similar circumstances. Excellent article Justin! I would like to point out a couple of tips for your readers. One is that the additional benefits of a polyurea floor coating system is that it can be applied in cooler temperatures than epoxy. This can be a nice feature for those who live in more temperate climates and are limited to a shorter time of year that they can apply epoxy. Also, be careful about what type of advice you receive about floor coatings from home improvement centers. 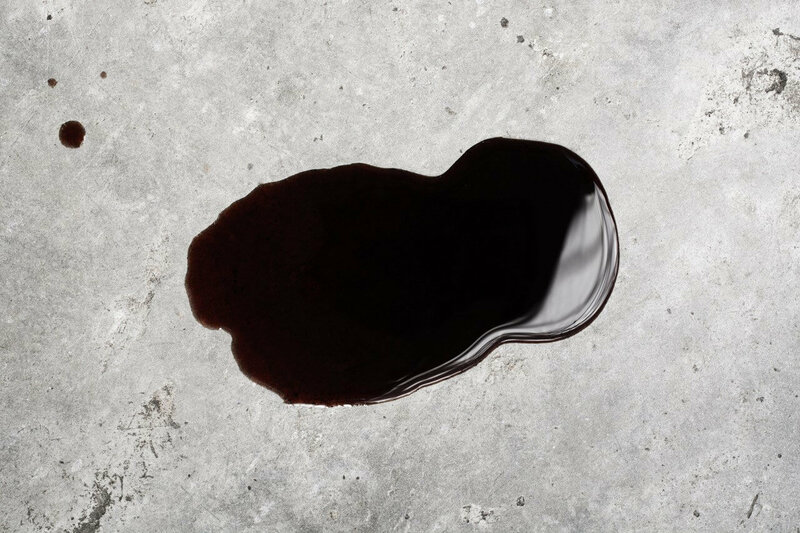 Though there are some very nice people who work there that are knowledgeable about a variety of subjects related to home improvement, concrete floor coatings is not one of them. You can rely on Justin and his staff to provide great information. And don't be afraid to ask them questions. 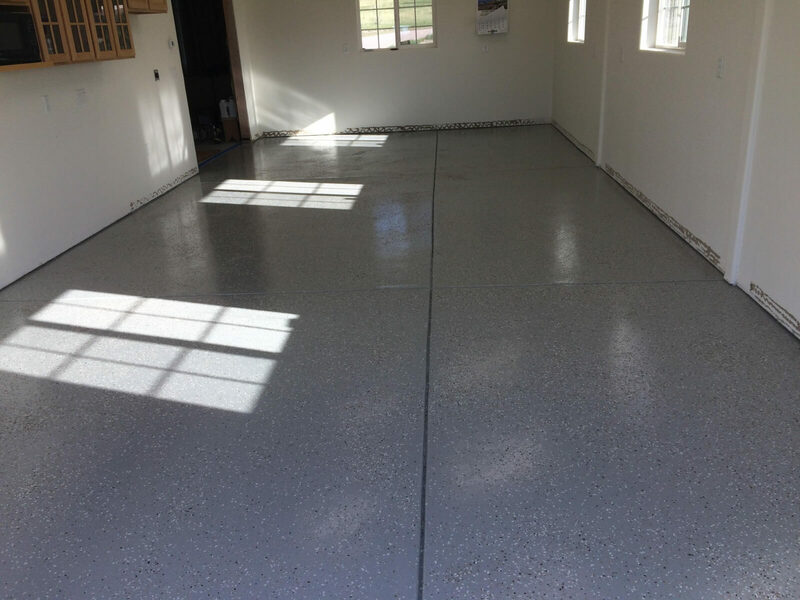 Concrete floor coatings is one of their specialties and getting the correct information is vital for a successful project. Thanks Shea! Very good point regarding the home centers! We encourage people to work with concrete temps 50+ but a very valid point there too. How low have you gone?